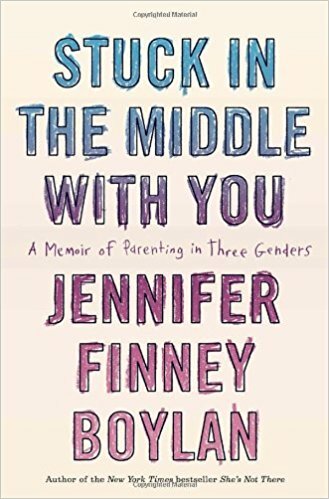 When I first read the subtitle of this book, A Memoir of Parenting in Three Genders, I assumed that the person who would be gender fluid or transgender would be the child. Actually, this is a memoir of a man who becomes a woman. She keeps the question live: does this mean she is a father who becomes a mother? Even when her wife was the one who bore their children? I love the complexity of her portrayal. Sometimes books that have topics such as transgender identity get mired in self-importance. This book was not at all like that. It was funny. Jenny is very likeable. Jenny would describe how as a man, she used to squirt whip cream into her dog's mouth to make her child laugh out of desperation for things to entertain him with. And then wonder if that is something that made her a man. As Jenny says, her own experience is very lucky. Her partner and children stay intact as a family despite the big transition. Her friends and community are for the most part supportive. Not everyone is so lucky. But I appreciated the hopefulness that this account portrayed. In addition to her own story, she includes interviews of many of her literary friends about their views on parenting and children. These interviews are very off-the-cuff and intimate. Some might wonder, if not much changed besides her gender, was it really that important to change genders? Jenny doesn't address this as fully as I would have liked, probably because it's a hard concept to communicate. She does talk about the burden of carrying a secret like that for so long and how much easier it is without that burden. Reading this has made me want to read her earlier account, She's Not There, about the process of becoming a woman. I highly recommend this for anyone who might feel uncomfortable when faced with transgendered issues. Though certainly there is no universal experience for people who are transgender, this is a very human portrayal that makes the issue more accessible. I haven't read a book that deals with a topic like this and the premise sounds interesting! Maybe I should pick this up.